» Former Carlow Association London man Niall Sheehan from Kilcoltrim is All-Ireland Cross Country Champion. St Patrick’s Day in New York is looked forward to with excitement every year and the 2015 event proved another successful occasion with 4 generations of Carlovians involved. 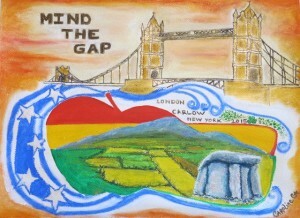 This year saw a delegation from the Carlow Association of London also travelling over to take part. The Parade is America’s oldest and proudest Irish traditions, held for the first time in 1762 – some fourteen years before the Declaration of Independence. The route is along 5th Ave starting at 44th St and finishing at 79th street in front of the viewing stand at Central Park. 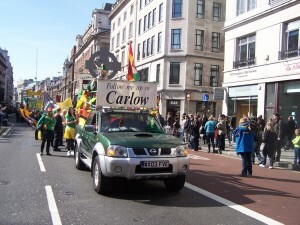 The Carlow Association joined it as it passed 48th Street with the parade numbering 200,000, with marching bands, schools, cultural and county organisations as well as police and fire departments and military groups from all over. Such is the size of the parade it takes some 4 hours to pass the giant crowd of spectators lining 5th Avenue. In John’s presentation speech he explained how the familiar words of the London Underground were adapted in embracing the gap, in nurturing it and keeping it alive. 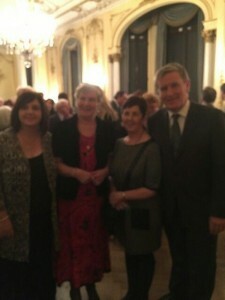 It was directed towards all Emigrant Carlovians in maintaining links with home. The concept was supported by Councillors Brian O’Donoghue and John Pender who represented Carlow County Council at the celebrations. The painting was created with symbolic meanings relevant to New York such as the Big Apple and the flag, London was show with Tower Bridge and the words Mind the Gap while Carlow’s Mt Leinster, the Haroldstown Dolmen and the colours Red Yellow and Green. A generous sprinkling of shamrock with its three leaves were used to represent London, New York and Carlow. A poem entitled ‘Mind the Gap’ also written by Caroline Cunningham and recited by John’s Grandson, 11 year old Dane Cruickshank was received with a great round of applause. Calling all Carlovians in London to St Patrick’s Parade and Festival 2015 – Sunday 15th March. 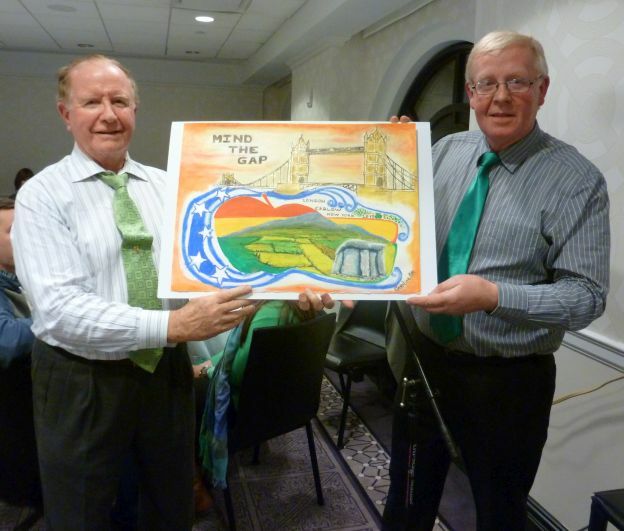 Its countdown to London’s 2015 St Patrick’s Celebrations on 15th March and the County Carlow Association in London plan to be out in force on the biggest National day in the world’s calendar. Will you be there in your ‘Red Yellow and Green’ Carlow Jersey or Irish Top waving your flag and banner. You’ll be made very welcome. Beigh fáilte romhat.. London is planning great celebrations with the mayor’s office presenting a free day of family fun. Come out on Sunday and help paint the town GREEN The parade leaves the top of Piccadilly by Green Park at noon forming up from 10am for floats and 11am for walkers from outside Green Park Station. It sets off at a jig to thread its way up Piccadilly, along Lower Regent, the Mall and Cockspur Street, rounding Trafalgar Square and finishing up in Whitehall. 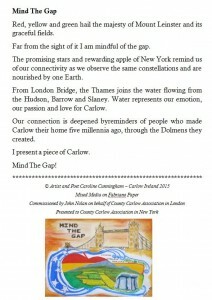 Come along and join the craic in following the ‘Follow me up to Carlow’ banner. Make it the event where all Carlovians in London can experience that ‘Special Gathering’ outside Ireland. Also see the wonderful floats from Irish County Associations, marching bands from across the UK, sports clubs and Irish Dancing schools. The parade finishes in Trafalgar Square to a backdrop of Irish culture from noon until 6pm featuring the cast of smash-hit West End musical The Commitments, performers from Lord of the Dance and rapper Lethal Dialect and much much more. There is also an Irish food market, children’s theatre, fashion show and the Prince Charles Cinema in Leicester Square is showing a selection of Irish short films. And if seeing all the Irish dancing inspires you to have a jog yourself there is a tea dance all afternoon at Westminster Cathedral Hall. On the cultural side there are readings to mark WB Yeats’s 150th birthday, and ahead of the parade there is a guided walk through Camden – the ‘capital of Irish London’ – taking in landmarks and telling the story of the community over the past 200 years. All roads lead to the Emerald GAA grounds in Ruislip on Saturday 21st February but for one 8 year boy his dream is about to come true as Carlow take on London in the Allianz National Hurling League Division 2A clash. 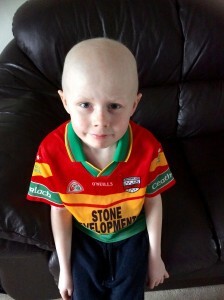 Timmy Shipton from the little village of Mayland in Essex will be a mascot for the Carlow team. Timmy’s first cousin Gary Bennett is one of the Carlow squad travelling to London this weekend. Hurling has always been a part of Timmy’s life, he has spent several holidays in St. Mullins with his family. Timmy and his cousin Gary are chips off the old Gladney block with hurling in the blood. Their Grandad, the famed Ned Gladney has won 8 Carlow Senior Hurling Titles between 1954 & 1966 an All Ireland & Leinster Junior Hurling Championship in 1960 and an All Ireland & Leinster Intermediate Championship in 1962. Timmy was diagnosed with Ewing’s sarcoma in July 2014. He has to endure several cycles of chemotherapy and has just recovered from extensive surgery in January. His Mum Maggie and dad Darren with aunts Josie and Jenny and his many friends will be in attendance and sporting the Red Yellow and Green in supporting the scallionaters on the day. Timmy’s bravery, optimism and resilience inspires all who meet him. We wish them all a great day. 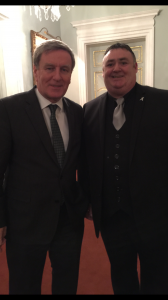 Carlovians in London were well represented on Wednesday 5th November courtesy of his Excellency the Irish Ambassador Daniel Mulhall at the 60th Celebration of the Council of Irish Counties Association in London. 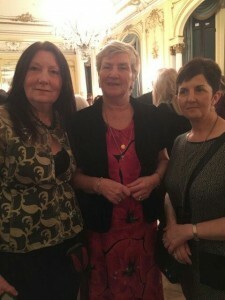 Carlow Association London has been a strong supporter of the CICA for those 60 years and been involved in many of their social, cultural and charity events during that time. 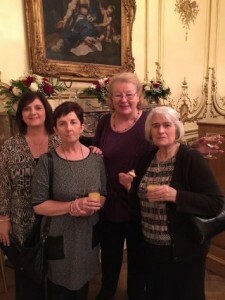 Representing Carlow in London on the night were:- Catherina Clarke, Bagenalstown.. John Kelly, Bagenalstown.. Cecelia Byrne, Bagenalstown.. Claire Nolan-Sturley, Carlow town.. Brenda Clarke, Bagenalstown & Anne Fennell, Carlow Town. A great night was had by all – and each picture tells a story! We regret to announce our 46th Annual Dinner scheduled for 18th October in the Crown Moran Hotel has been POSTPONED. We are working with the hotel on this and will be announcing a new date in due course. 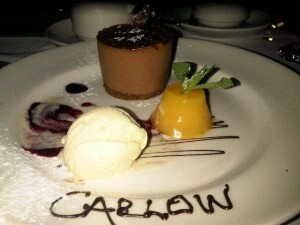 County Carlow Association London’s 46th Annual Dinner is 18th October in the Crown Moran. Have you got those post holiday blues? 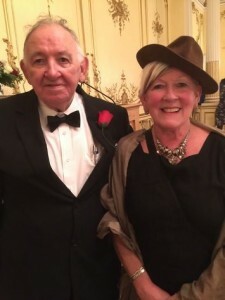 Then cheer up because County Carlow Association London’s Annual Dinner is set for Saturday 18th October in the world famous CROWN MORAN HOTEL http://www.crownmoranhotel.com/ at 152 Cricklewood Broadway, Cricklewood, London, NW2 3ED. and is all set to be a fantastic night with music song and dance in true Carlow fashion. The much looked-forward-to event is the Number 1 fixture in our yearly calendar and the ideal opportunity for all Carlovians and their friends here in London to catch up for some good old ‘craic caint agus ceoil’. Delegates visiting from Carlow include Cllrs from Carlow County Council together with some ‘added VIPs’ and a ‘host of surprises’ – certainly a night not to be missed. Plenty of craic agus ceol on the agenda. As we approach our 46th ‘annual do’ we are delighted to have Carlow’s Own Brendan Hennessy over to MC this year’s event. 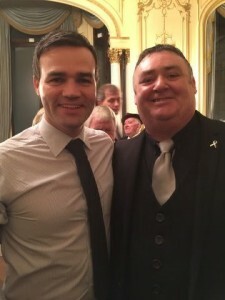 Known as the Michael O’Hare of Carlow and a great friend to the Carlow Association here in London Brendan has been involved in entertainment and broadcasting for over 20 years after starting out on his career as a comedian/impressionist winning many talent shows across Ireland. He has moved up the ranks in Irish entertainment over the years and now hosts some of Ireland’s biggest shows. He has numerous Television appearances behind him and at the moment is a freelance Radio and TV Commentator working with Setanta TV, TV 3, & Premier Sports TV. and now a familar face on the new Irish TV Channel. He spends a lot of time over in London in comparing the London Rose of Tralee selection nights and commentated just recently on the Senior London County Finals in Hurling and Football broadcast live on Irish TV to a global audience. And how can we forget that magnificent journey he brought us on with his ‘classic broadcasts’ on Mount Leinster Rangers great run in the AIB club Championships of 2013/14. They were off the scale! Brendan is now nominated for an Irish PPI radio award in December for his work on that. 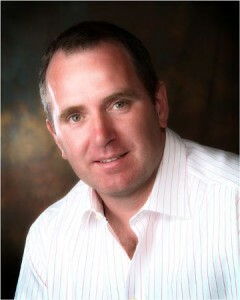 So sit back relax and enjoy Brendan who is making his debut at the Carlow Dinner as our MC. Brendan Hennessy to host County Carlow Association London dinner on 18th October. Our 2014 County Carlow Association Dinner is set for Saturday 18th October and travelling over especially from Carlow to MC our 2014 event in London’s Crown Moran Hotel will be Carlow’s ‘very own’ Brendan Hennessy. Brendan Hennessy to host County Carlow Association London dinner. 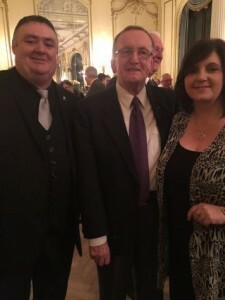 Known as the Michael O’Hare of Carlow and a great friend to the Carlow Association here in London Brendan has been involved in entertainment and broadcasting for over 20 years after starting out on his career as a comedian/impressionist winning many talent shows across Ireland. He has moved up the ranks in Irish entertainment over the years and now hosts some of Ireland’s biggest shows. He has numerous Television appearances behind him and at the moment is a freelance Radio and TV Commentator working with Setanta TV, TV 3, & Premier Sports TV. Some of you might have tuned into him during the GAA leagues of the past few years and also the Rugby coverage of the Rabo direct league. Hennessy’s latest work includes the All Ireland Hurling and football championships of 2014 and the Heineken Cup, he also had the honour of commentating on Leinster’s three great Heineken cup victories 2009, 2011 and 2012. His stage work takes him to corporate events all over and as an MC he hosts a lot of high profile shows. Brendan hosted 18 centres for the Rose of Tralee this year including the London selection at the Crown Moran and the Carlow selection at the Mount Wolseley Hotel in Tullow. He describes himself as ‘one of the lads’ and has been a great ambassador for Carlow over the years promoting our county with every opportunity he gets. For six years he hosted ‘Hennessy’s Weekend’ on KCLR allowing many a Carlovian in London – and across the world – to feel at home when tuned in to his dulcet tones. Many thanks Brendan. Saturday mornings will never be the same again! And how can we forget that magnificent journey with his ‘classic broadcasts’ on Mount Leinster Rangers great run in the AIB club Championships of 2013/14. They were off the scale. Brendan is now nominated for an Irish PPI radio award in December for his work on that. On the Playing Fields he played rugby with Carlow from a very young age to adult and was a member of St Patrick’s boys AFC Carlow and was first team founded in 1975. On the Gaelic pitch he played with Graiguecullen up to U21 level but had to retire competitively at 21 due to a serious injury. He’s a very keen golfer and a member of Deer Park golf club since juvenile, where his brother Thos is vice captain at the moment and will be captain for 2015. He loves all sports, supporting Chelsea in football and Leinster in rugby. 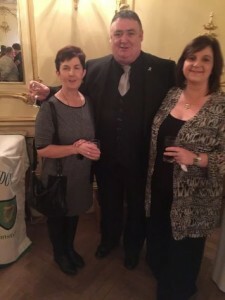 His spare time – when he gets it – is spent on charity work, as a volunteer for the local Carlow charities , especially the Home Care team and the national charities in the Carlow area. 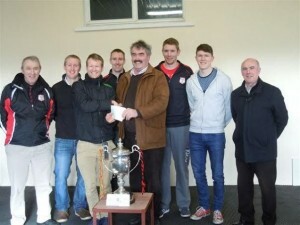 Carlow Association London pledge their support for Mount Leinster Rangers. We are glad to announce that Carlow Assoc London have become one of the sponsors of Mount Leinster Rangers http://www.mtleinsterrangers.gaa.ie/ as they strive for All-Ireland glory. The Carlow Senior Hurling Champions saw off stern competition from the Wexford champs Oulart-The Ballagh to win the Leinster with a fantastic 0-11 to 0-08 win in Nowlan Park to become the first Carlow side ever to win a Leinster SH club title. They then went on to beat Loughgiel Shamrocks 0-18 to 2-11 in the semi in Pairc Esler, Newry booking their place in the All-Ireland club hurling final in Croke Park on St Patrick’s Day. The club itself was founded in 1987 with the amalgamation of the three existing club teams Borris, Ballymurphy and Rathanna the three villages of the parish and since then has enjoyed great success in all grades of Gaelic football, hurling, camogie and Ladies’ Gaelic football. All roads from Carlow and further a field will lead to Croke Pk on 17th March and prove a day not to be forgotten in the annals of GAA sport and we in the Carlow Association London will also be in attendance adding to the support team for our true champions. 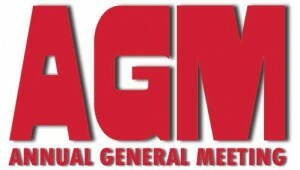 ANNUAL GENERAL MEETING – 2014 – 25th February. Do come and see how last year went and hear our plans for the coming year. We would also like to meet up with the latest tide of Carlovians to London there also so please pass the word out to all your friends. As this year comes to an end we are delighted to send you our very best wishes for Christmas and the New Year. The year 2013 was a busy year as always for us here in the Carlow Association London (CCAL). Some of the highlights were London St Patrick’s Parade, Emigrants dance in Leighlin Bridge, Crawley Irish Festival, London Irish Vintage Rally, and the Run for your County fun run. All events and many more met the remit of why the CCAL was set up some 45+ years ago and that was to organise social events that appeal to all. Yes we met our objectives and can say without any fear of contradiction a good time was had by all. The looked forward to event last October proved itself as a very successful evening as we marked our 45th Milestone. We would like to thank all for making it a success, those who gave raffle prizes and those who helped with the organisational tasks on the run up to it. Delegates visiting from Carlow included Cllr Des Hurley, Cathaoirleach Carlow County Council together with Cllr Eileen Brophy, Cathaoirleach of Carlow Town Council as well as councillors from both councils. Our guest for the evening was the newly appointed Irish Ambassador to the United Kingdom Mr Daniel Mulhall and his Australian wife Greta. Dan as her likes to be called hails from Waterford delivered a great after-dinner speech setting out his goals for his duration here in the UK and pinpointed some notable people from Carlow who have made a name for themselves across the world. But the biggest cheer was reserved at the end for the ‘Tullow Tank’ himself Sean O’Brien. And to add that extra bit of glamour the London Rose of Tralee, Grace Kenny also attended. Carlow was more than represented at this year’s event. Crawley native Grace Kenny who’s dad Martin was from Tullow became the London Rose way back in April and took on her role with great confidence during the summer. In front of a packed audience the politics graduate spoke with great pride of her Carlow heritage as one of the final 32 in The Dome in Tralee when screened on RTE live with Daithi O’Sé. Grace was sponsored by Crawley’s Celtic and Irish Cultural Society in the competition and is looking forward to a great year in representing London’s Irish community. Special thanks has to go to former member of the CCAL Harry Hynes now based in Tralee for acting as perfect host to Grace’s supporters. As a backdrop to the Eigse Arts Festival and following an invitation from Cllr Eileen Brophy, Cathaoirleach of Carlow Town Council we were represented at the Carlow Gathering Event. Also in attendance were the twinned communities of Dole, Banbridge and Northwich and also Carlow Association Birmingham. The weekend highlighted the closeness of the communities and how the council at home maintained that link for the benefit of all emigrant communities. . Early in the coming year we’ll be linking up on a project with Carlow County Museum on Carlow Trivia. We are in communication with Dermot Mulligan the Museum’s curator who’ll set a question on stuff to do with Carlow its history, culture and heritage. It’ll be posted on the website and the social networking forums and will give all a chance to test your knowledge and get more involved in who we really are. There is also a Museum blog being put together from January the plan is to update it every fortnight with ‘guest writers’ such as the CCAL and others where we would be invited to pen articles on our experiences in London and how we have made that contribution to life here in the UK. The blog would be no more than 1,500 words per posting with approx 4 photos. The blog is set up so it can be easily shared through social media outlets. So there is something to think about over the Christmas break! Did you know we are now on Facebook and Twitter. 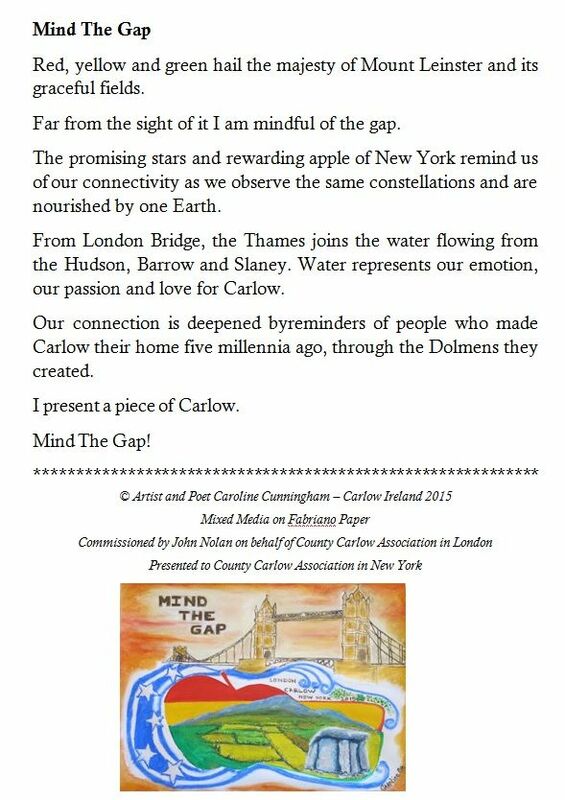 Yes as well as via our website we can be contacted also on our FB page Carlow Association London and Twitter CarlowinLondon. This newsletter wouldn’t be complete without honouring Mount Leinster Rangers our history makers from the 3 villages of Ballymurphy Rahanna and Borris. Its the first time ever a Carlow Senior hurling club has achieved this and South Carlow is buzzing since. I don’t think any of us will forget where we were when we heard Brendan Hennessy’s excellent broadcast on KCLR that Sunday when the lads beat Oulart the Ballagh, the Wexford Champs in the final in Nowlan Pk. Since then the news of their victory has gone across the world and it would be safe to say we’ll be inviting a few of the players and the cup over to our 2014 Dinner. As they approach their next game, the semi-final on the second weekend of February they are fundraising with a 5K and 10K ‘Run with the Leinster Champions’ fun run in Borris on the 28th December at 12 noon. A great way to use up the stored calories from the Christmas festivities. All the senior hurlers will take part and if you are around the area you can help also by running, walking or crawling or by just making a donation. If you have just settled here in London or have a family member or friend that has why don’t you get them to make contact. We have teamed up with KCLR and the Sue Nunn show so you can send Christmas greetings back home. No matter where you happen to be why don’t you private message via the Sue Nunn facebook page, you can email them on thesuenunnshow@kclr96fm.com or call them on 00353-56-7796272 quoting ‘Christmas Wishes from Carlow Association’ at all times. Your messages will be read out on the regular Sue Nunn shows on Monday 23rd and Tuesday 24th December. Not forgetting Brendan Hennessy on Hennessy’s Weekend on Saturday next between 10 and 12. Brendan’s a true Carlovian with red yellow and green blood running through his veins and has always given the CCAL a shout out whether he be commentating on Hurling, Football or Rugby or broadcasting from his studio. You can make contact with him via the KCLR website or his facebook page. Here’s wishing you all a happy and peaceful Christmas and may all your wishes be granted in the year ahead. Looking forward to seeing and hearing from you real soon. 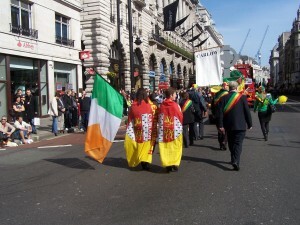 » Calling all Carlovians in London to St Patrick’s Parade and Festival – Sunday 17th March. » Carlow Footballers celebrate a great win in London..
» Carlowman in London explains why the Irish in Britain should vote to remain in the EU in the forthcoming referendum.